WordCamp Pokhara 2018 took place this past Saturday. It was the first-ever WordCamp that took place in the beautiful city of lakes, Pokhara. The event concluded with a grand success. The organizers and volunteers were on their toes to make the event successful and it was great to see that their hard work and dedication paid off. Everything was great, the venue, the people, the presentations; everything was well organized. We, being the official online media partner of WCPKR 2018, live-tweeted the major parts of the event. You can find them here. But, we wanted to write a more detailed account of the event so that people who missed it can get the gist of the day by reading it. So, let’s get started! Let’s start off our article with the place itself. WCPKR 2018 took place at Hotel Pokhara Grande, one of the popular hotels in Pokhara. Located near the airport, it was easily accessible. It had ample parking space with round the clock security. There were two halls booked for the WordPress conference—Hall Manaslu and Hall Annapurna. Both of the halls were huge and had plenty of space, well-suited for presentations and talks. So, Hotel Pokhara Grande was undoubtedly a perfect pick for the event. The organizers and volunteers of the event were present at the venue way many hours before the attendees started to roll in. They barely had time to catch their breath. The registration desk, sponsors’ desks, and swag store were all set outside the two halls. As per the schedule, the registration for the event started at 8 A.M. The organizers and volunteers were very busy managing the event. The attendees flooded into the swag store to grab their swags right after the registration. Then followed opening remarks by Pratima Sharma, co-founder of Mandala IT Solutions. She welcomed the attendees and thanked the sponsors, organizers, and volunteers for their support and hard work. After the opening ceremony, the official event started featuring many interesting presentations. Furthermore, one of the highlights of the event was the Fun Photo Station photobooth. The Fun Photo team added extra excitement and fun to the WordCamp. It had some amazing props and interesting photo frames. People were enjoying the photo session at the Fun Photo booth. Talking about the presentations, the overall quality was excellent. The day featured sixteen different speakers. And, just prior to the closing ceremony was an interesting session featuring Narayan Koirala with Pratima Sharma as the moderator. He shared his “Success Stories” with everyone in the audience in Hall Manaslu. The event was then followed by the closing ceremony where all the sponsors, organizers, volunteers, media partners, venue partner and more were provided with “Token of Appreciation”. Furthermore, during the event, we, the DevotePress team also had the chance to take interviews with few of the speakers; you can later find them here. 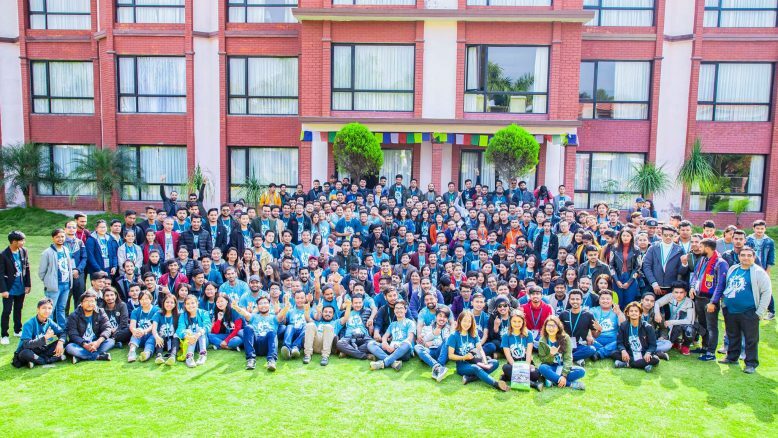 Besides all these, WordCamp Pokhara 2018 also featured a group photo session. After conducting a long day of WordPress conference successfully, it was time for some fun. Bajeko Sekuwa, Naagdhunga served as the venue for the after-party. It provided a chance for everyone to network with one another, explore new ideas, build camaraderie, and just have fun after the WordCamp. All in all, WordCamp Pokhara 2018 has officially ended with a huge success. The hashtag #wcpkr2018 got trending on Twitter during the event. WordCamp Pokhara 2018 gave everyone a chance to meet and network with a lot of new people, and learn a lot from talks. A big thank you from the DevotePress team to all the organizers and volunteers for their effort and dedication. We’re looking forward to the announcement of WordCamp Pokhara 2019. Also, if you had missed the event or any session you wanted to attend, you can later catch it up on WordPress.tv once they post it. ← Previous Previous post: WordPress 5.0 Release Candidate Now Available! Next → Next post: WordPress Bharatpur November Meetup 2018 Announced!